(From left, back): Matt Whitfield, Will Tribble, Grady Fisher, William Bell; (front) Mary Brooks Thigpen, and Elizabeth Burford. Jackson Academy National Merit Semifinalists and commended students have a significant trait in common — they like being challenged. Whether navigating white water rapids in West Virginia, improving a cross-country track time, or delving deep into AP literature or chemistry, bringing their A game to any task is second nature. These JA students expect to give their best. Along with high scores, semifinalists and commended students at Jackson Academy illustrate that an individual can lead a full life and still make academic excellence a priority. The example they provide is often noted across campus. “One thing that I love about all these kids is their work ethic,” said Paula Pratt, Upper School counselor. 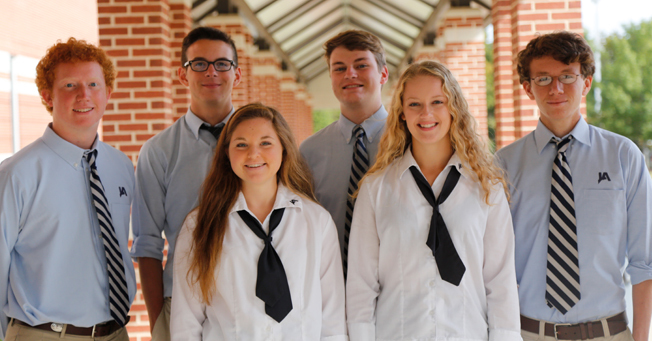 Grady Fisher, Mary Brooks Thigpen, William Bell, Elizabeth Burford, Will Tribble, and Matt Whitfield shared a few reflections of their time at JA. You may know him as the lead drummer for the JA Band. AP English Language and Composition with Mrs. Mealer, for sure. She was an excellent teacher and really helped me develop my writing skills. The class itself was just fun to be in, and the group projects were always entertaining and interesting. Enjoy high school while you can, and don’t be lazy. High school is the foundation on which the entire rest of your life will be built, so make sure you make this foundation a good one. Any words of wisdom as a JA senior? Real people don’t really care how you get things done (unless it’s illegal of course) as long as it gets done. So don’t just follow the status quo, find your own solutions to life’s problems. You may know her as the volleyball team captain. I loved learning more about writing and how effective different techniques can be in developing language. Mrs. Mealer is a wonderful teacher, and I loved being challenged. My writing abilities have grown enormously because of that class. The more rigorous a class is in high school, the more prepared I will be for college. Also, the satisfaction that comes with solving problems or learning new information is totally worth the work it takes along the way. What motivates you to be a good student? My dad always tells me: “We are called by God to do our absolute best in everything.” School is a part of “everything,” and God demands my best in my classes just as much as in all other areas of my life. You may know him as Kevin. The teachers at JA genuinely care about informing and improving their students, and they have the knowledge and ability to do this. The learning environment set up inside and outside of the classroom offers growth in anything from morals to math literacy. Although I do not know for certain which university I will attend, I plan on majoring in physics and maybe doing graduate work in astronomy to get myself into the field of astrophysics. What things do you do outside of class and which is your favorite? I go camping as much as possible, I play way too many video games, and I am working on my pilot’s license. They’re all great, but if I could never go camping again, then my life would be a wreck. You may know her as…Service Club president. Hard classes push you to do better than to just get by, because usually just getting by isn’t enough in a harder class. You have to become a better student, a better time manager, and prioritize better. Any other advice for academic success? Be organized and manage your time well. Know what tests and projects you have and when they’re due, and take advantage of your free time. Sometimes you won’t be able to get every single thing done, but it won’t be like that all the time. Also, it really is best if you don’t procrastinate. I think something to remember is that we’re not always going to live in our little JA bubble. Yes, high school is very important, but you need to have a little perspective. The test you bombed isn’t going to matter in five years, or ten, or fifteen. (As long as you don’t bomb five, ten, or fifteen tests in a row). So while you’re here, do the best you can, but don’t get bent out of shape if things don’t go your way. You may know him as a Jackson Academy cross country runner, baseball player, and Rowdy. Favorite things: Baseball and cross country teams, Rowdies. How has JA helped you prepare for academic success? At Jackson Academy, you are pushed to be your best self from the first day you are on campus. Challenging work and very encouraging faculty members and teachers provide everything needed to not just get by, but thrive academically. For me, taking honors and AP courses taught by teachers very knowledgeable about their subjects and very encouraging to me as a student has prepared me to take on any challenge I face in my academic career. It is my desire to become an engineer and use my extensive knowledge gained in college to affect the world in a positive way. My goal is to be a part of or lead the teams that develop the technologies of tomorrow that improve society and further raise our standard of living and security. Looking back on my 13 years at Jackson Academy, I can identify one thing that has helped me out more than any other. I have developed great relationships with nearly all of my teachers, to the point where I can just have casual conversations with them at any time. I feel like through these relationships, I have been encouraged to achieve more than I ever thought possible. There have been so many instances where a good relationship with a teacher has helped me out in a tight situation, and I have received so much help and support from the Jackson Academy teachers and faculty. Let them help you and motivate you, because I promise that they want nothing more than for you to succeed and achieve all that you want and more. You may know him as a longtime member of the band. I’d have to say that my favorite thing I do with JA is the Outdoor Club. Many of my closest friendships at JA have been a product of the many outdoor trips I’ve been on. How has JA prepared you for academic success? JA’s teachers have done a fabulous job of making school enjoyable. Class discussions play a large part of it for me, because involvement and engagement are how I learn best. My family has repeatedly reminded me that I can do anything or go anywhere I want, which is a big inspiration. It’s much harder to overcome people telling you that you can’t do something than it is to do it with full support. Everyone ought to try developing legitimate friendships with their teachers. My teachers have helped me outside of class as much as they have in class.